PracticeLink.com S UMMER 2018 51 features THE INTERVIEW ISSUE ▲ ▲ ▲ KAREN EDWARDS I t too K the PR e MA tu R e D e A th o F h IS FA the R to convince Josh Valtos, M.D., to leave a thriving cardiac surgery practice and move closer to family. Amy Canuso, D. o ., made a similar decision when she moved her family from Guam to Iowa. Although she was not unhappy with her practice in child and adolescent psychiatry, "For us, it was the right decision," she says. 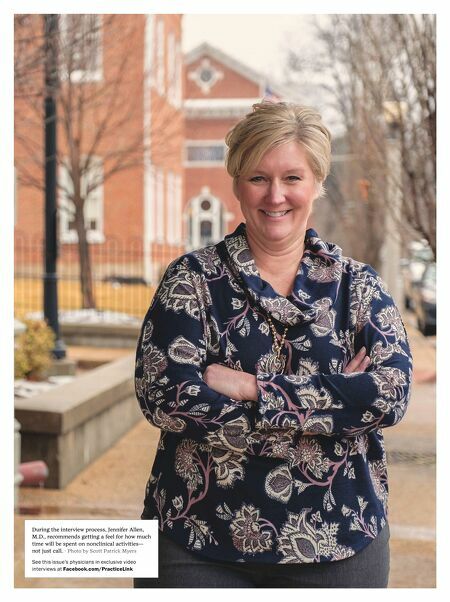 For Jennifer Allen, M.D., it was the end of her family practice residency that spurred action. Though each of these physicians had different motivations, each found a job search squarely in their future. Looking for work is hardly a new phenomenon these days for physicians — or anyone else. According to The Balance, an online publication that covers personal finances, the average person changes jobs 10 to 15 times over the course of his or her career. Physicians aren't exempt from work transitions. And with that comes the biggest question: Will the change be a good move…or not? "It's an employee market out there for physicians," says Valtos. The market needs you. But how can you decide if a job offer is the right one for you and your family? Certainly, completing residency or fellowship or deciding on a geographical move are among the many reasons why physicians look for work. 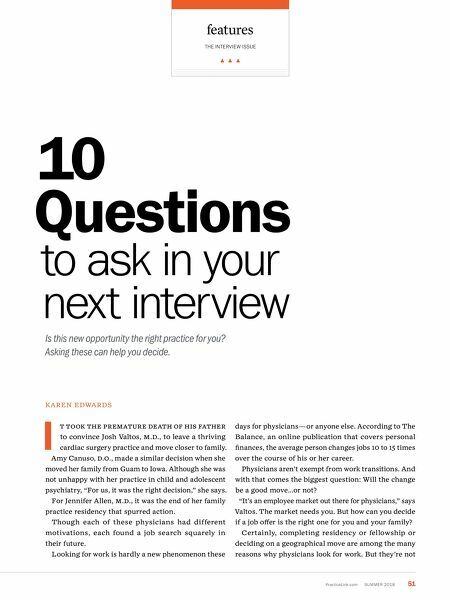 But they're not 10 Questions to ask in your next interview Is this new opportunity the right practice for you? Asking these can help you decide.